In the Auction House players can bid on items as well as place items to be put up for sale. 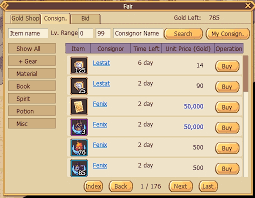 The Auction House can be accessed either through the 'Fair' button or by clicking the 'Auction House' in the chat area. Players can outbid others, and if a player is outbid by another player their gold will be sent back to them. There is also a search option to help players look for specific items.